This has been a huge month for c!! 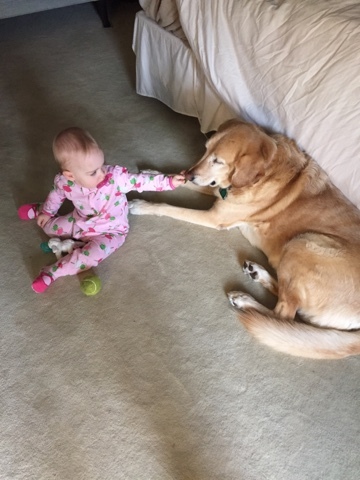 She started walking a couple of days before she turned 13 months but really took off a few weeks later. She could walk on her own but it want her favorite or primary mode of transportation until a couple of weeks later. With walking has brought bumps and bruises. It breaks my heart every time she falls and cries. I know this is a stage every child goes through but it's hard on this mama!! It still surprises me sometimes when I see her walking around like a full grown person! She had started to move towards dropping her morning nap but since she has started walking she has decided it's a better idea to keep it. Rather than a cat nap in the morning she is back to an hour nap and then another usually 2 hour nap in the afternoon. I was really liking the one nap schedule but I'm sure we will be back to that soon. She has started to love sleeping in the satin pillow from her glider. The one in the picture is a photo pillow my sister in law had made for her with a picture from her wedding. C loves it because it has momsie and auntie m on it. I have to hide this because she gets too excited and won't sleep. Haha! Actually she has to be on one nap by June when she starts school. Yes my big girl is going to school two days a week this summer and I am so excited. She loves other kids and is so active I know she will love it! I wasn't worried to leave her one bit, but recently she started showing a little separation anxiety. 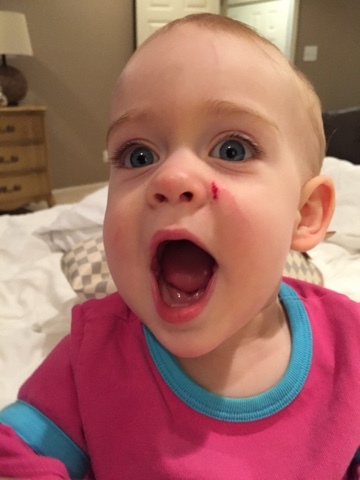 She does this usually when she hits a wonder week (have you checked out that book yet--it saved me!) so it's not unusual but this has by far been the worst experience. Now she can say mama so she just screams for me now. It's never for long but it is quite heartbreaking! I'm hoping she gets past it in a couple of weeks!! She has also been a little crabby lately because she is getting her molars. Thankfully she isn't having too rough a time with them but sometimes we can tell she isn't feeling well and her mouth is hurting. The weather has been wonderful lately and she is loving playing outside. She loves to ride in her swing and she and I always sing to her while she's in it. 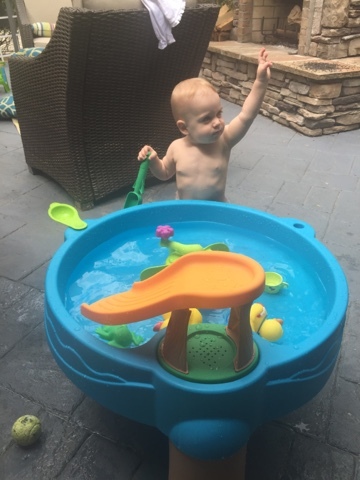 She also played with her water table for the first time this month and enjoyed it so much!! I can't wait to see how she does at the pool this summer! She also likes walking bare footed in the grass. In terms of talking she is trying very hard to say new things. She usually just tries the first syllable of words. 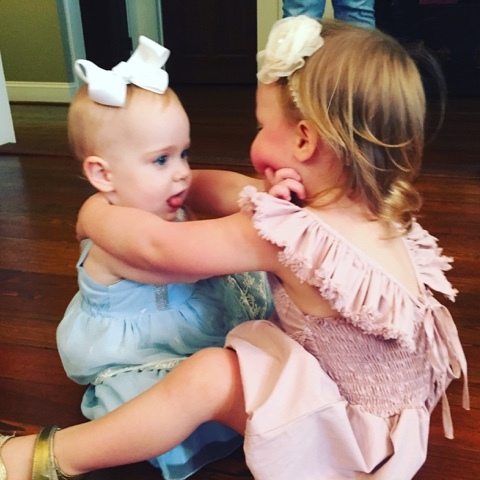 Lately she has been saying "harp" for her friend Harper and points at our phones because she knows we have picture of her and Harper on there. She also is doing "moo" for what a cow says but usually it comes out "oom" and she sticks out her tongue for what a frog says. She will even growl for what a car says. Her latest trick is to "nuzzle" you and it seriously will melt your heart. She is working on her letters and can recognize a couple! I know that sounds a little bit nuts but she really loves the letters DVD and was recognizing them just from watching the show so we started to work with her a little without pushing it. It's so funny when she says O! She also is recognizing some colors! I'm telling you guys--the preschool prep DVDs are amazing!! I'm continually amazed by what all she knows! Forrest says she is only held back by us not teaching her so since she is so eager to learn we are taking advantage of it. She also likes hiding and having us find her, playing I spy while looking out the window, watching and singing to doc mcstuffins, and chasing the cats. She has a stuffed cat and she always puts it in the window because she sees our cats sitting there too. She still loves jewelry and mommys make up and tries to put her feet in my shoes and brushes her hair with my hairbrush. 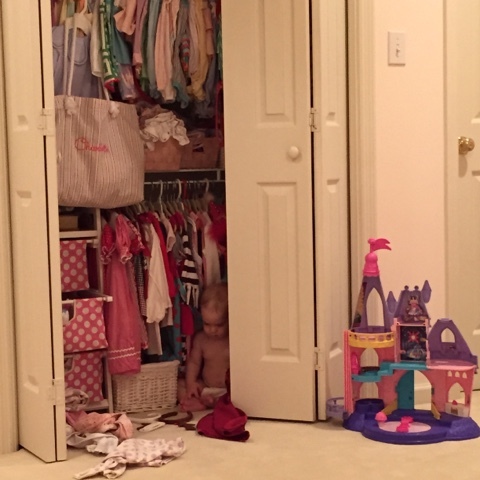 Playing in closets is also a daily activity! Her hair is looking very red to me and is filling in but is still slow to grow!! She says bye bye to her bath water and diapers when we throw them away or books after we are finished reading. She also loves her baby doll and is so sweet to her. And of corse she is still enamored with Sonny! We stopped using bottles this month too. I know you are supposed to stop at 12 months but I didn't think she was really attached to hers and just didn't have it in me to deal with another transition so we waited. Luckily I was right and she did not care to lose the bottle at all. This month she had lots of fun! 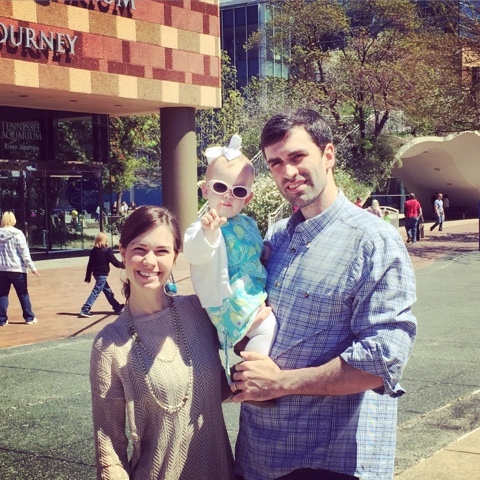 She got to visit her auntie m and go to the aquarium. 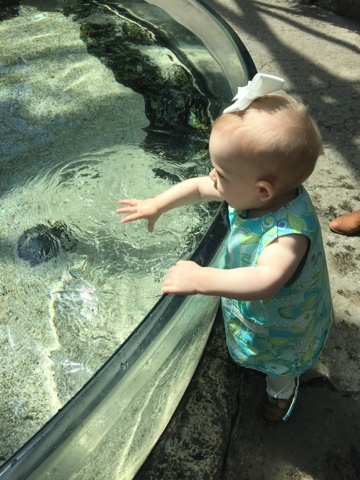 She loves touching the sharks and watching the Penguins. 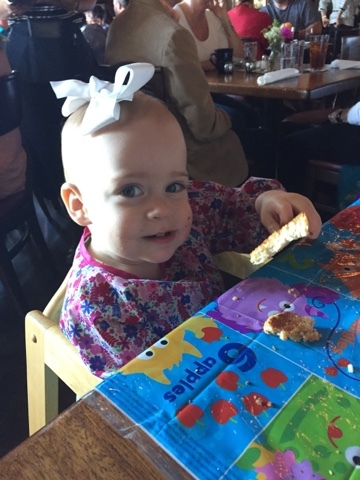 She got to see cows and chickens at her mama and papa B's house and spend time with her great granddaddy Harold. 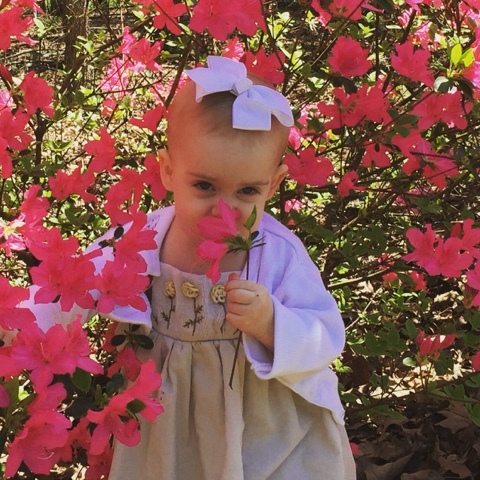 She also had a fun photo shoot with mama B's azaleas! I really wish I could put down all the things she is learning and doing but it's too much. I guess at this age kids are developing and changing so quickly it's hard to keep track! Plus they all do things in their own way and in their own time so it's cool to me to see what things other babies are mastering. I enjoy writing this post each month because it makes me excited to see what she might do in the next 4 weeks! 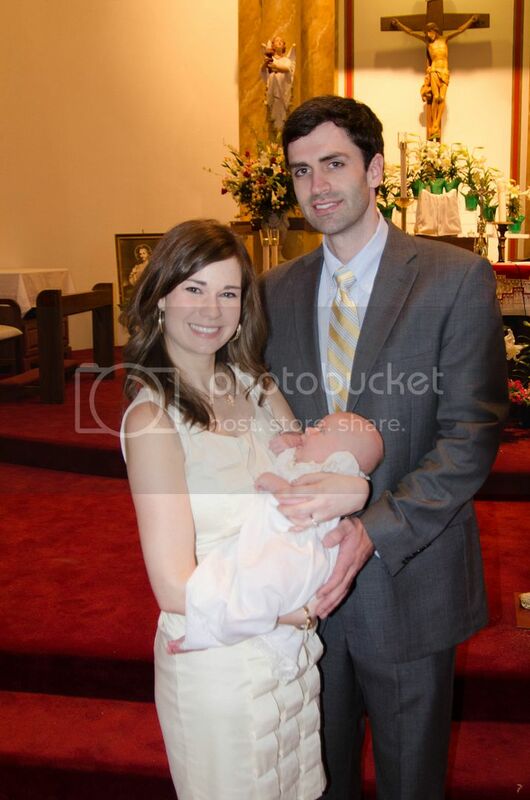 On Easter Sunday, April 5, 2015 (yes, one year ago today), we had Charlotte christened at 5 weeks old. She was baptized in the same church that I was, and where her daddy joined the church and was baptized, and where her parents got married. It was quite meaningful. 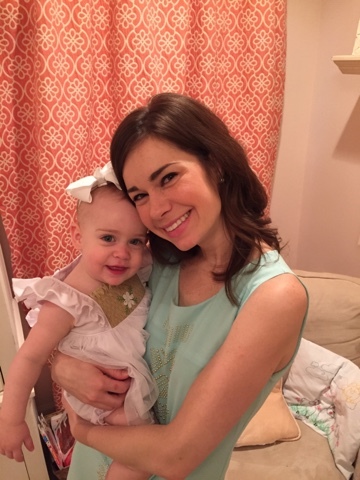 My mom hosted a grand lunch for all of our family before hand and it was so sweet to see our extended family get to meet Charlotte. My mom went to so much trouble to make the lunch picture perfect and that really meant the world to me because I couldn't have done it myself. 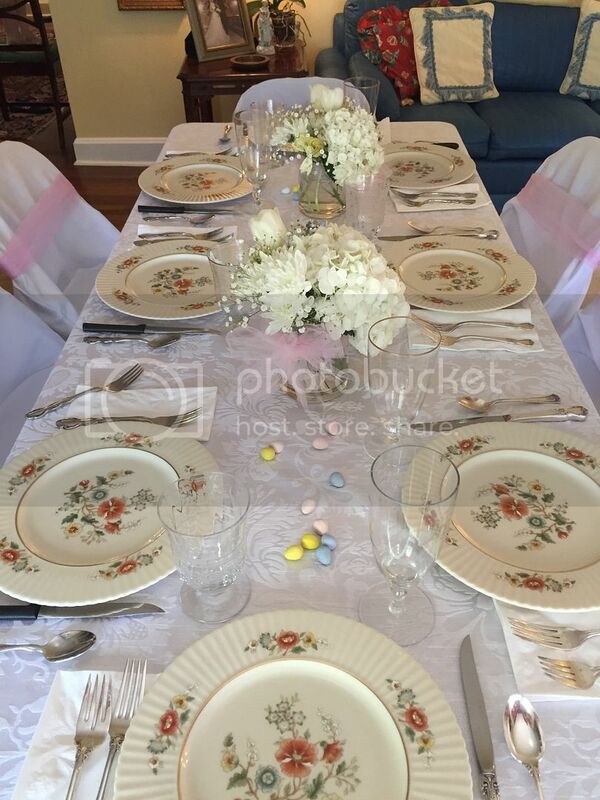 One of the 3 tables my mom had--we were a full house! 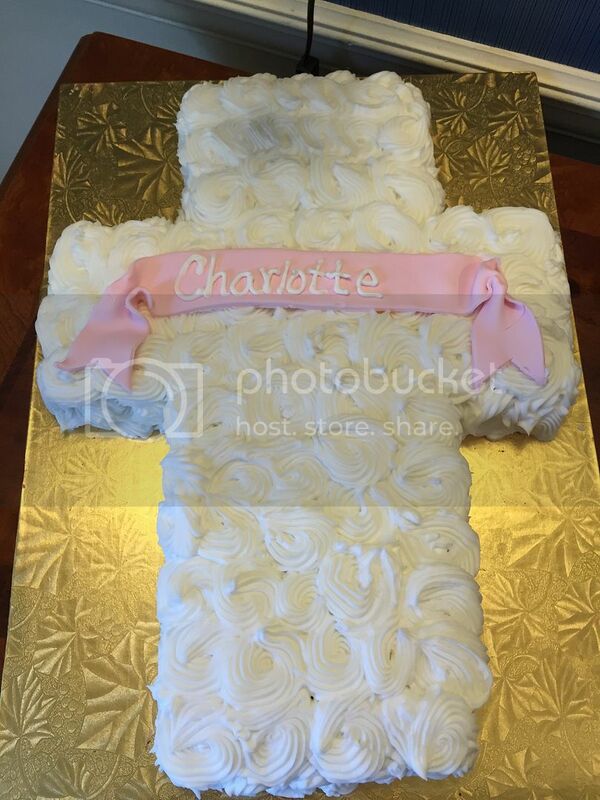 The bakery perfectly recreated the cake I had seen on pinterest for Charlotte's big day. It was also perfect for all those who had given up sweets for Lent! 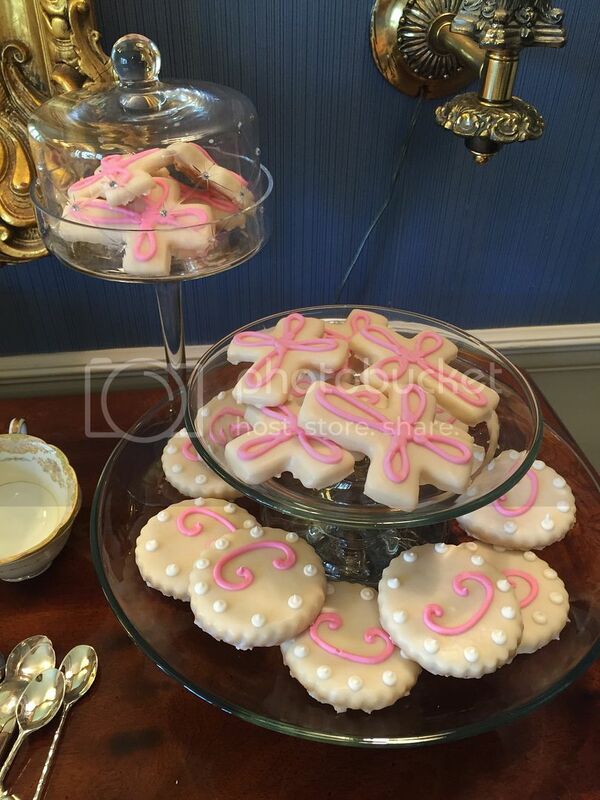 No party is complete without cookies by the one and only Alison Hathcock! 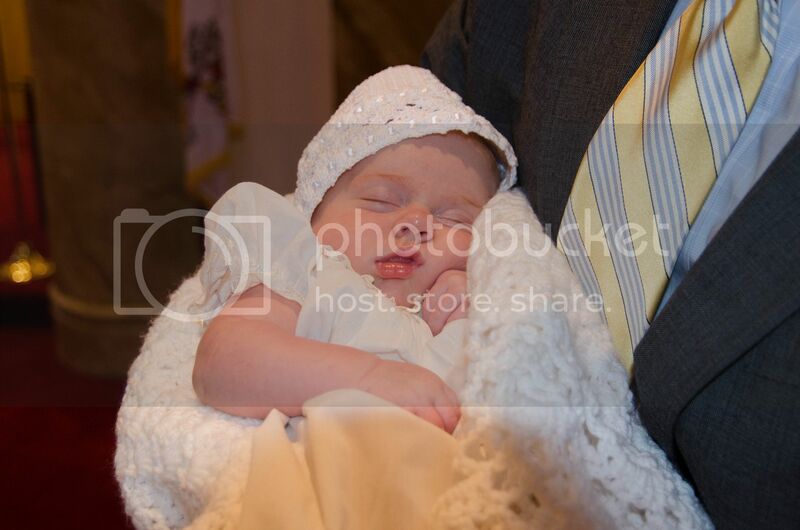 Charlotte wore my christening gown and her bonnet, booties, and blanket were hand crocheted by my mom. I thought she looked angelic. During the ceremony we promised to raise Charlotte as a child of the light and that made me smile because even now she is fascinated with lights. I hope she always has that same fascination and child like wonder and awe. 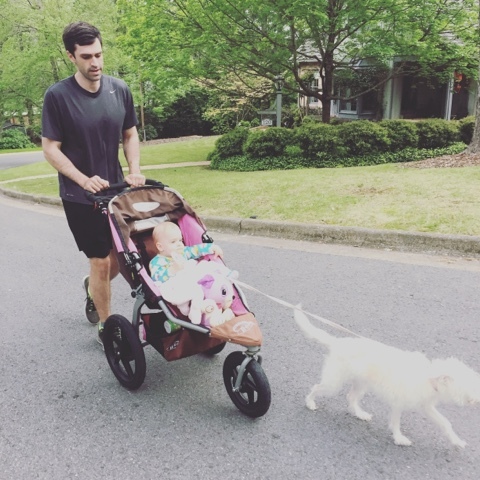 I am forever grateful and mindful of the true gift and blessing that Charlotte is and Forrest and I don't take our responsibilities to her lightly. It was kind of nice to makes those promises to the Lord in front of our families and friends just like we did on our wedding day. 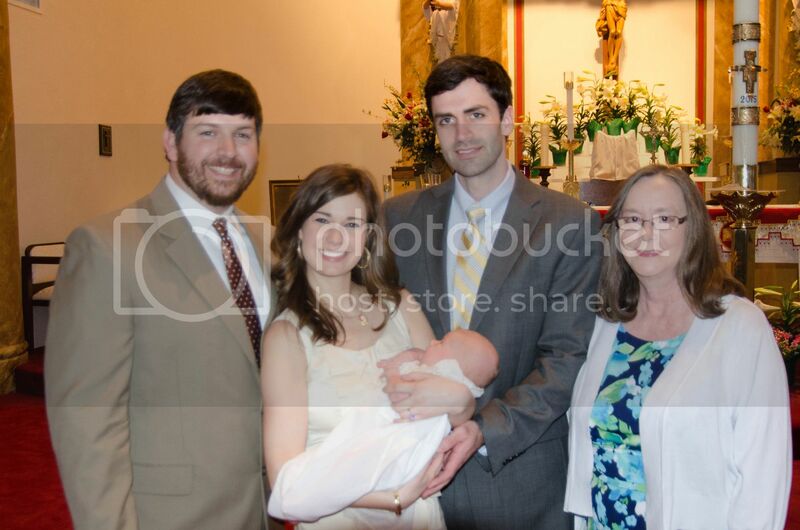 We chose my cousin Stevie and Forrest's Aunt Paula as Charlotte's godparents. I hope that they will always remain extra special people in her life that she can always look to for advice, guidance, and fun! That wonderful day was just the first of many big events in Charlotte's life that we will get to share with her and prepare her for. 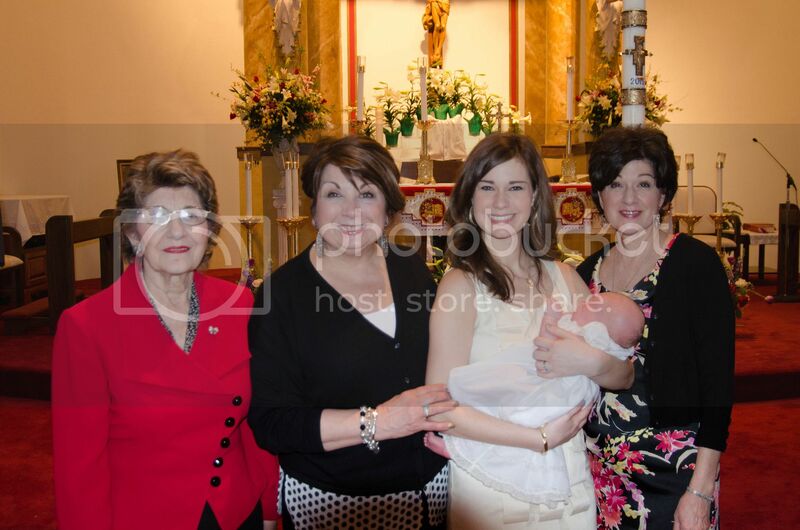 I hope she is surrounded by just as much love at those events as she was at her christening!